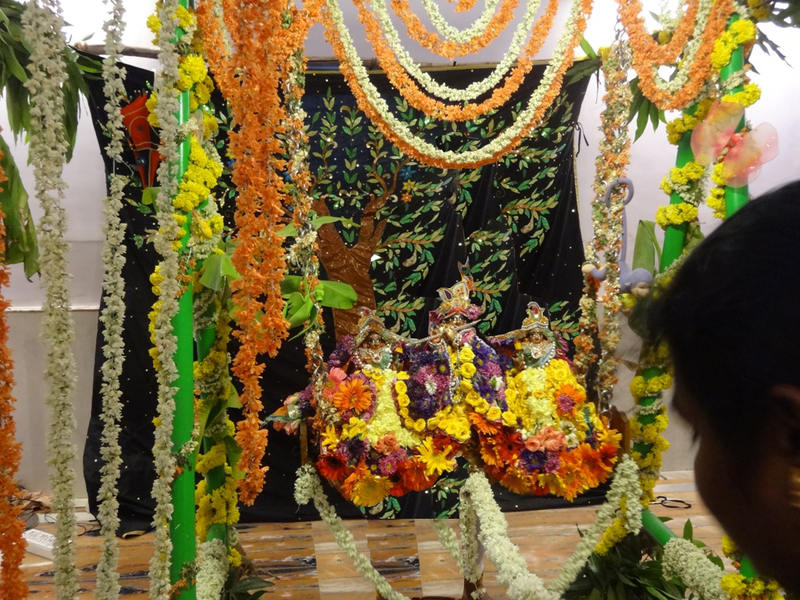 ISKCON Chennai will celebrate the appearance day of Lord Balarama on 26th August, Sunday from 10am to 2pm with Jhulan yatra, arati and uri-adi (dahi handi). 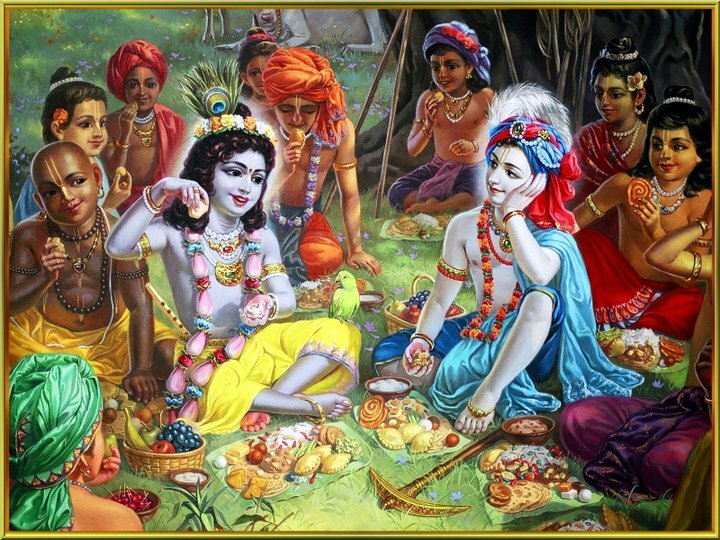 Please participate in the festival by bringing sweets, fruits and honey which are very much relished by Lord Balarama. Samba, the darling son of Jambavati and Krishna, kidnapped Laksmana the daughter of Duryodhana from the assembly were she was supposed to choose her husband. The furious Kauravas after a prolonged fight, finally arrested Samba by sending in six of their greatest warriors. When the Yadavas heard of this they prepared for battle but Lord Balarama pacified them, preferring to find a peaceful solution. However when He requested the Kauravas to return Samba and Laksmana, the Kauravas responded by insulting Him and the Yadava dynasty. 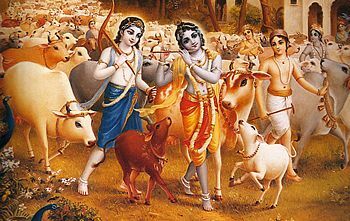 Understanding them to be ignorant in their false prestige, Balarama took His plow and began to drag Hastinapura into the Ganges. The terrified Kauravas now surrendered to the lotus feet of Balarama, begging for His mercy. They immediately returned Samba and Laksmana and had them married ceremoniously with many opulent gifts. When Lord Balarama entered the assembly, understanding Him to be the Supreme Personality of Godhead, all present rose to offer Him respect. However Romaharshana, proud at occupying the position of the leader did not get up. Lord Balarama could understand that even though Romaharshana was a an expert Vedantist, he had not yet realized these teachings. 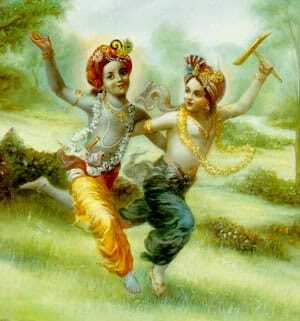 Considering him unqualified to lead the ceremony, Balarama touched him with a blade of grass causing him to die. 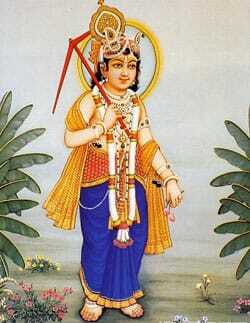 He then instituted Suta, the son of Romaharshana as the leader of the assembly and continued with His pilgrimage. Jhulan yatra is that very special festival where each and everyone present can render personal service to Sri Sri Radha Krishna by swinging them. The Jhulan festival starts on 21st August and goes on till the 26th. It will happen on these days from 6.30pm to 7.30pm. 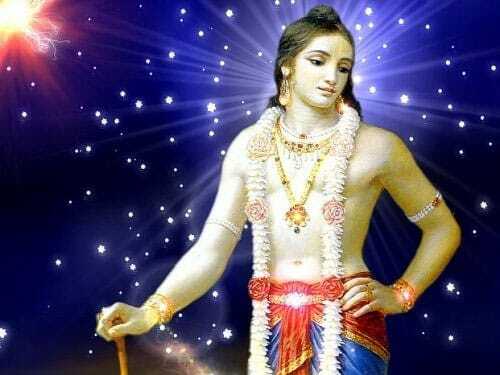 On 26th Sunday, along with Jhulan festival in the afternoon, we celebrate the appearance day of Lord Balaram also. One of the most popular events in the holy town of Vrindavan, India – where Lord Krishna appeared 5,000 years ago – is the celebration of Jhulan Yatra, the Radha-Krishna swing festival. In Sri Vrindavan for five days, in many of the 5000 temples there, the small Utsav-vighraha functional Deities (Vijay-utsav bera) are taken from the altar and placed on an elaborately decorated swing in the temple room. After receiving the traditional arati worship, the Deities are pushed on Their swing. The atmosphere of this festival is especially sweet as everyone has the chance to intimately serve Radha and Krishna by pulling the swing. The same festival is observed in other parts of India too in this sacred month of Shravana. In our ISKCON temples we observe for five days in accordance with Srila Prabhupada’s instructions. This is a wonderful ceremonial function of Lord Krishna’s pastimes that reflects practically how we are to render service to the Lord for His pleasure. These festivals are not in any way mere rituals, as they all have practical service functionality to invoke loving servitude of the devotees for the Lord. Lord Sri Krishna is the Supreme enjoyer and doesn’t have to work hard like us in this world. Everything He does is pleasurable, and He organises many situation in which He can incorporate us, His separated parts and parcels into His loving service which is our natural condition in the spiritual realm. 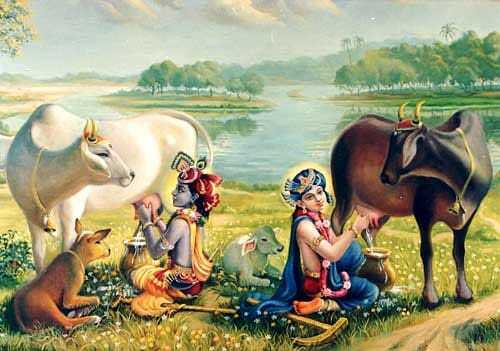 When Sri Krishna had his pastimes in rural Vrindavan with His cowherd friends together they lovingly tended the cows, and wandered in the pastures playing, frolicking, and feasting. 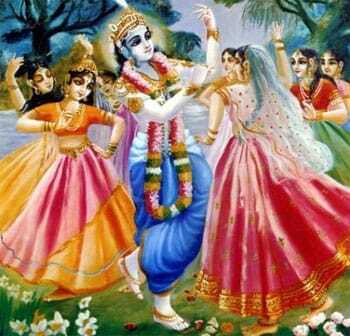 Throughout the various seasons they all continuously enjoyed being part of Sri Krishna’s pastimes, and rendering loving service to Him as best they could. It is a most pleasing and satisfying festival, with the swings often highly decorated with forest creepers, Jasmine (Malati) that has newly blossomed in the season, and streamers of garlands. Sometimes they use a fine spray of rose water and direct it toward the Divine couple of Radha and Krishna on Their swing. On the last day of the Jhulan, on the Purnima (full moon) this comes Lord Balaram’s appearance day festival. Let us participate in this festival and offer our loving devotional service to Sri Krishna and Srimati Radharani.